Christopher G. Ulloth joined Project Y in 2014 as a wee Playwright Intern, then blossomed later that year into a Literary Associate. As a playwright, he was a semi-finalist for the 2015 Eugene O’Neill National Playwrights Conference. His plays have been presented at or received development with the Seven Devils Playwrights Conference, Project Y Theatre, the 92nd Street Y (different Y’s) and Bloomsburg University. 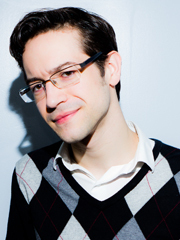 He is also a Co-Artistic Director of Elephant Room Productions. He received his Bachelor of Arts from Bloomsburg University.